Weaning with That First Spoonful of Cereal + GIVEAWAY! Leave a Comment on Weaning with That First Spoonful of Cereal + GIVEAWAY! Introduction to solids is a new chapter for every baby. With weaning, baby gets to experience eating and this calls for some food and mess ahead! With Leroy turning 6 months old, we were looking forward to start on his weaning journey. There’s no hard and fast rule to start at 6 months old exactly, but it is essential to look out for signs to find out if your child is ready for solids. Baby is able to sit up well without support. Baby has lost the tongue-thrust reflex and does not push solids out of his mouth with his tongue. Baby is able to chew. Baby is developing a ‘pincer grasp’ i.e. uses thumb and forefinger to pick up food or objects. Baby is eager to participate during meals or shows interest in food, and may try to grab them and put in his mouth. Since a baby’s digestive system is pretty immature, it’s wise to start with simple food. Cereal is one of the recommended first foods for babies, and it’s usually done via spoonfeeding due to its smooth nature. It is also important to look for a trusted brand to ensure that the food is of certain standards in terms of quality, manufacturing hygiene and safety. Everyone knows NESTLE, and this household name offers CERELAC® to provide quick and easy baby food. CERELAC® is the first and only infant cereal with BIFIDUS BL probiotics which helps promote healthy digestive systems. What’s more, each spoonful contains iron-fortified goodness along with vitamins, minerals and DHA which are important for healthy brain, eye and overall development too! Why is iron important for weaning babies? Along with haemoglobin, iron is important in our bodies as it helps transport oxygen from our lungs to the rest of our body. The lack of iron (or a deficiency) results in physical and mental delays. Research show that babies are born with an iron reserve, and for the first six months, baby obtain iron through breastfeeding. However, some mums may have low iron levels (like me!) or are anemic, and this affects mum’s health and her breastmilk too. Baby gets 5mg of Iron from a bowl of CERELAC according to the recommended serving. As a guideline, babies between 7-12 months require 11mg of iron daily. While I’m not the type of mum who measures all the nitty gritty, I do acknowledge the need for iron as I had low iron levels during both pregnancies. I definitely do not wish for my children’s health and development to be affected, and the best way is to ensure they obtain iron through food. Parents who would like to know how much iron your babies are taking daily, the CERELAC® Iron Calculator is a helpful tool! As you might already know, I enjoy feeding my family and try to come up with recipes whenever time permits. Now that Leroy has started weaning, this spells exciting times for us, and quick and easy baby food ideas are always my favourites! Let’s see how baby Leroy takes to his #myfirstspoonful at 6 months 10 days old! So, he decided to grab the spoon and feed himself! Guess CERELAC must be finger licking good too! Well, this little guy was eager to grab the spoon to feed himself, so I’d say – he enjoyed his CERELAC® Infant Cereal! As I love experimenting new recipes, we came up with a simple baby food to include avocado. Leroy has tried avocado (we follow the 3-day rule for new food introduction, just to ensure there’s no allergy concerns) and hence we decided to combine both. Avocados are superfoods packed with nearly 20 essential nutrients such as good fats, fibre and folic acid. Mummy’s new recipe: Rice & Mixed Fruits Cereal with Avocado! Prepare CERELAC® according to instructions on packaging. It’s really simple: we added 2 teaspoons of cereal into room temperature water to dissolve the cereal. Then mix with breastmilk and stir. Adjust the amount of water and/or breastmilk according to your preferred consistency. Choose a ripe avocado, slice it and use a clean spoon to scoop. We put about 1 teaspoon of avocado. You may mash it completely, and there’s no need to steam/boil/cook the avocado. Mix both together and feed baby! Leroy was eager to eat, and I literally had to fight to get that spoon back! LOL. So we thought of using CERELAC® in different ways, and entertained wild ideas about baking muffins too! Since Leroy has yet to try that many ingredients yet, we decided to go with something simpler – using CERELAC® as a dip! Steam some carrot fries (other veggie sticks are possible too!) about 5-6 minutes over boiling water. Check doneness with a fork and remove to let them cool down. And, get ready to dip! But I’ve to forewarn you: it got messy because baby wanted to pull the little cup (which is a silicon mould, and not exactly the most ideal item to be placed in front of a curious bub! LOL.). This would work great too, with an older child who’s learning to dip in sauces – try it! Take heart, parents! Weaning is an experiential journey, and our little ones are simply enjoying the sensorial experience and making amazing discoveries! A cereal dip for me, mummy?? Weeee! While some parents may worry if the infant cereal may be a little too heavy on baby’s immature digestive system, NESTLE takes care of this concern and shares that a unique technology, Cereals Hydrolyzed enzymatically (CHE) is used in CERELAC® to efficiently breakdown carbohydrates in the baby-grade cereal for easier digestion and absorption by baby’s body. Other common concerns include: cereal being too sweet for babies, cereal is considered “heaty” or that infant cereal doesn’t fill baby’s stomach and will cause them to be hungry quickly. Personally, I believe in eating in moderation. It’s always good to maintain a balance diet through a variety of food sources to ensure babies obtain the necessary nutrients for their development. As for the CERELAC® with Honey which is suitable for babies from 8 months, parents are confused why babies below one are able to consume that. Honey is not recommended for babies below one due to risk of contamination and botulism. To address this, NESTLE assures that the honey used has been heat-treated where the spores are killed and growth is prevented. This helps make it safe for little ones. With NESTLE’s rich history and experience in nutrition, I feel assured to know that CERELAC® is a science-based product to help babies obtain well-rounded nutrition so they are fueled to meet their developmental milestones. For 150 years, NESTLE has earned the trust from mums all over the world, and it’s heartening to know that many babies in Singapore are eating CERELAC® too! In fact, CERELAC® is the number 1 infant cereal brand in Singapore*, which are also endorsed by Healthcare Professionals. Wish to let your little one try the CERELAC®? Get your FREE samples here! CERELAC® is available at leading Supermarkets, Hypermarkets and your favourite online stores: Lazada (One Mart), Q10 (One Mart), RedMart and Nestle E-shop. Don’t forget to use ShopBack to earn additional cashbacks and discounts when shopping Lazada and RedMart! Don’t say we didn’t tell you! 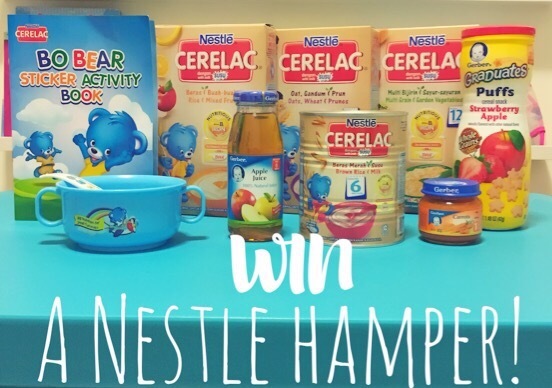 WIN a NESTLE HAMPER to kickstart your baby’s weaning journey! There are 3 sets up for grabs! The HOOTING POST x NESTLE are giving away 3 sets of CERELAC® Hampers to your babies! Follow the steps below to stand a chance to WIN! 2) Share this article on your Facebook timeline with caption “My baby is ___ months old!” and tag at least 3 friends. Don’t forget to set your account to ‘public’ so we can verify this step. ***BONUS entry: Increase your chances by following us on Instagram and reposting the above contest image and hashtag #THPperks! 1) Contest ends on 1 September 2016, 2359 (Singapore time). 4) Winners will be announced on Facebook, and winners will be required to provide their contact details so the NESTLE team can get in touch with you on the delivery/collection of your prize. Does your baby enjoy cereal too? Do share some yummy food you’ve made with cereal too!